So Many Movie Reviews! Three Billboards, Phantom Thread, Game Night, Lady Bird, and more! 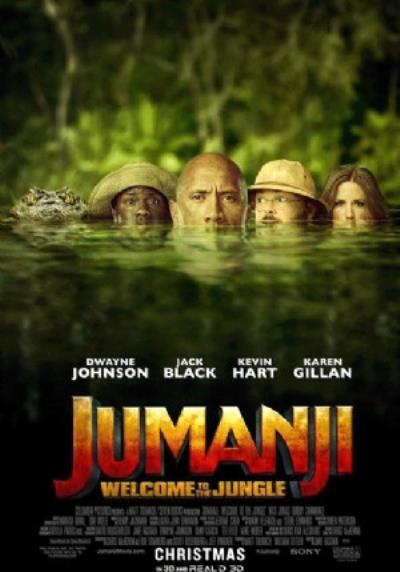 Jumanji: Welcome to the Jungle (2017) was a movie that I immediately wrote off when it was announced, but as the release date approached, I was intrigued enough to check it out. It was fun. All the main actors are funny and I was laughing through most of the movie. I wish there were more animal encounters, but I can hardly complain about this sequel – it was better than it had any right to be. Anyone interested in watching this shouldn’t be disappointed. Replay Value: It is fun enough to watch again, but unless Dina wants to see it, that probably won’t happen. Sequel Potential: Can you believe this grossed $400 million in the United States alone? To put that in perspective, that’s just under the combined box office receipts for Justice League and The LEGO Batman Movie. It did more business than Guardians of the Galaxy Vol. 2, Spiderman: Homecoming, and Thor: Ragnarok! Unreal. So yeah, lots of potential for more Jumanji. Dina Meter: My wife would have definitely enjoyed this movie. 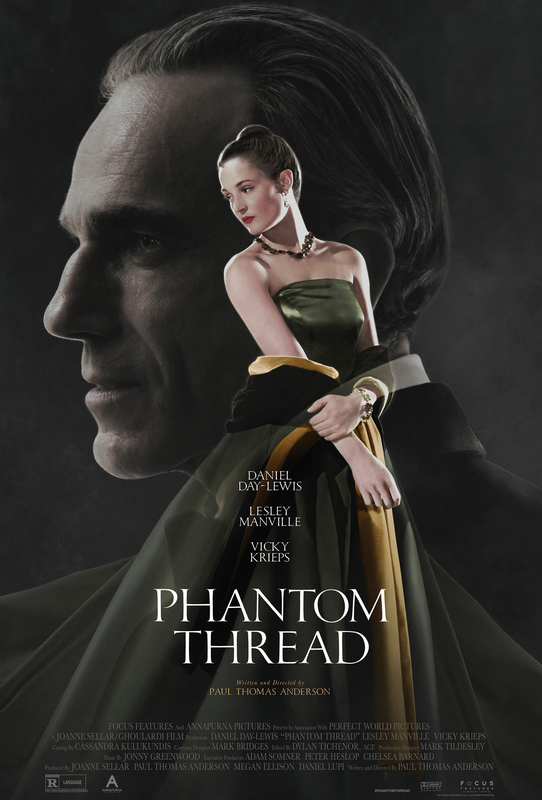 Phantom Thread (2017) was more high level filmmaking from director Paul Thomas Anderson. Daniel Day-Lewis gives his typical powerhouse performance, although this one has quite a bit less dazzle than some of his best work. Still, his high strung and OCD fashion designer Reynolds Woodcock is another very memorable DDL character. The writing, direction, and acting are all very well done in this film, but fair warning, it does get a bit weird towards the end. I doubt general audiences would be enthralled, but those of you that enjoy more artsy films should find a lot to appreciate here. Phantom Thread is a film that is already making me reexamine my new movie ratings because it doesn’t seem to fit the “Highly Enjoyable” or “Fun” categories, but it was certainly a better film than Jumanji: Welcome to the Jungle. Replay Value: I would take this journey again. Oscar Potential: Acting nominations for DDL and Lesley Manville, plus Best Picture, Best Director, Best Original Score, and an unsurprising win for Best Costume Design – it is a movie about a fashion designer! Dina Meter: Definitely not Dina’s kind of movie and if she did watch it, she would have been out in the last half hour. Lady Bird (2017) was a lot of fun, but I have a confession. The trailers for films are so long these days that I no longer make it a priority to be in the theater when the movie is supposed to start. The actual film almost never starts until 15 minutes after its listed showtime. Well, I walked into Lady Bird over ten minutes late and the feature presentation looked like it was well in progress. Walking in late to a Best Picture contender is inexcusable and I think it may have hindered my experience ever-so-slightly. Still, I definitely enjoyed Lady Bird. Saoirse Ronan was absolutely terrific and her character, while a flawed teenage girl trying to figure things out, was one of 2017’s best movie characters. Laurie Metcalf was also great as Lady Bird’s mother. On the other hand, this movie was a good contrast for Timothee Chalamet’s performance in Call Me By Your Name. After seeing him in this, I’m upgrading his performance in Call Me By Your Name to truly phenomenal. I give Lady Bird a strong recommendation and I feel like I owe it another watch myself. Replay Value: High on my list to see again immediately. Sequel Potential: Seems very unlikely. Oscar Potential: Five nominations: Best Picture, Best Director, Best Original Screenplay, plus Saoirse Ronan for Best Actress and Laurie Metcalf for Best Supporting Actress. Dina Meter: I am looking forward to watching this with Dina and I am sure she will like it. The Post (2017) was an enjoyable politically-charged newspaper thriller with a standard Oscar-worthy performance from Meryl Streep and lots of quality work from the rest of the cast. The story of a government cover-up and a small newspaper putting everything on the line to publish the conspiracy was actually quite a bit more entertaining than I was expecting. It’s still difficult for me to picture The Washington Post as the Oakland Athletics of the newspaper world, but this movie has a bit of a Moneyball feel to it. I tend to prefer Steven Spielberg’s adventure spectacles, but at this point, I think you have to give the guy credit for being very adept at making political thrillers. Replay Value: Not really a movie I’m looking to watch more than once. Oscar Potential: Two nominations: Meryl Streep and Best Picture. Dina Meter: I think she’d like The Post. Three Billboards Outside Ebbing, Missouri (2017) might be one of the most polarizing films of 2017. I’ve seen people say it was the best film of 2017 and I’ve seen people say they hated it. Honestly, it’s a tough film to rate. There was definitely times during the movie when I thought it was the year’s best film. Frances McDormand gives my favorite performance of the year – of that, I am certain. Sam Rockwell and Woody Harrelson also chip in with exceptional performances. Much like the film itself, Rockwell’s unhinged police officer is one that is likely to divide audiences. He’s an idiot and a total loose cannon that seems to have no leash and there seems to be no good explanation for his free reign of destruction. The character is rather despicable but Rockwell’s acting is off the charts. I loved him in this movie. Three Billboards is brutal, shocking, and full of twists and turns and will possibly leave audiences shaking their heads or unsatisfied, but I thought it was great. McDormand and Rockwell give two of my favorite performances of 2017 and the plot, although absurd at times, is insanely entertaining. This movie is a total spectacle and a must see in my books. Replay Value: I am looking forward to watching it again. Sequel Potential: Almost none. I guess it’s possible, but I don’t see any reason to continue this story. Oscar Potential: Seven nominations: Best Picture, Best Film Editing, Best Original Score, Best Original Screenplay, and Woody Harrelson, plus well deserved Oscar wins for Frances McDormand and Sam Rockwell. Dina Meter: I have no clue where my wife will fall on this movie, but I’m looking forward to finding out. 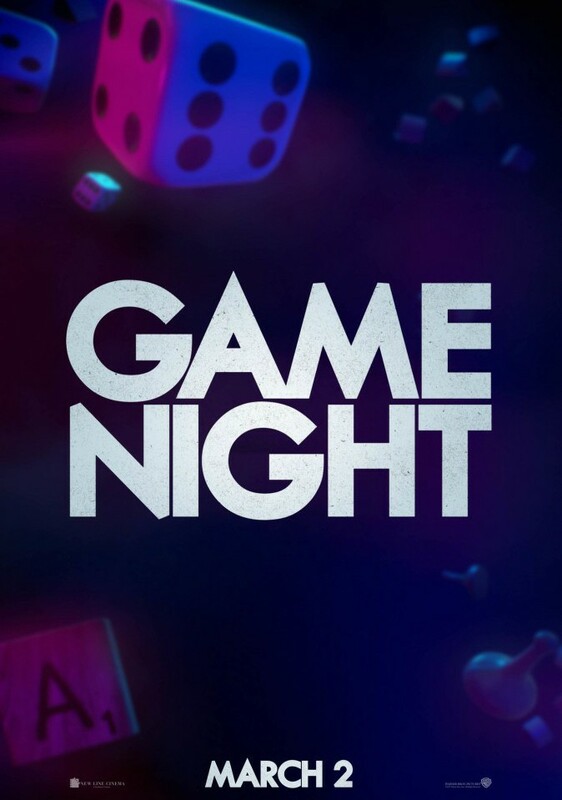 Game Night (2018) was tons of fun. Absolutely Hilarious and totally unexpected. Jason Bateman and Rachel McAdams were terrific and had great comedic chemistry. Jesse Plemons is also hysterical every time he’s on screen. I mean absurdly funny… like I laughed through almost every second of his screen time. Game Night twists and turns so much you’re never really sure what’s real and what’s not (and neither are the characters in the movie) and it doesn’t get so outlandish that it becomes ridiculous. This would have been the best comedy of last year and after a brief glance it looks like I’d have to go back years to find a straight comedy that I enjoyed more than Game Night. If you missed this in theaters, make sure you check it out on home release – it’s a must see comedy and very fun flick. Replay Value: Comedies are best the first time, but I’d happily watch this again. Sequel Potential: Successful comedies always have sequel potential. Dina Meter: If Dina doesn’t love Game Night I’ll be shocked. Annihilation (2018) is writer/director Alex Garland’s follow up to his terrific Ex Machina. I don’t know. There’s a good movie in here somewhere, but I didn’t love it. Annihilation is intriguing, at worst, and there are some thrilling moments when the women enter The Shimmer and encounter some strange beasts, but the last 20 minutes or so of the film are definitely going to lose viewers. I’ve read a number of people that loved this movie, but I’m among those that were kind of boggled after Natalie Portman reaches the lighthouse. Ex Machina was a bit weird too, but I think it was substantially more palatable than Annihilation is. The cast here is okay, but nothing remarkable. I’ve read enough good things about Annihilation to know it has an audience, but it was a slight miss for me. Sequel Potential: I believe this was the first adaptation in a series of novels. Oscar Potential: A February release and a divided audience are going to hurt its chances, but I suppose a Best Adapted Screenplay could be a long shot. Dina Meter: I think making Dina sit through this would ruin her day. Red Sparrow (2018) did not grab me at all. To be fair, I was incredibly distracted while watching it, as I explained in this post, but even if I was focused on the movie, I don’t think I would have been impressed. This is the least inspiring performance I’ve seen from Jennifer Lawrence to date and none of the characters I saw were interesting or likable at all. I walked out of this movie probably less than halfway into it. Replay Value: I will probably give this a second chance on home release. Sequel Potential: $44M in gross with a budget of $70M is a dud. Let’s just stop now and let J-Law focus on meatier roles. Oscar Potential: More like Razzie potential. Seriously… drawing live IMO. Dina Meter: Dina could probably stomach this movie if she were multitasking. 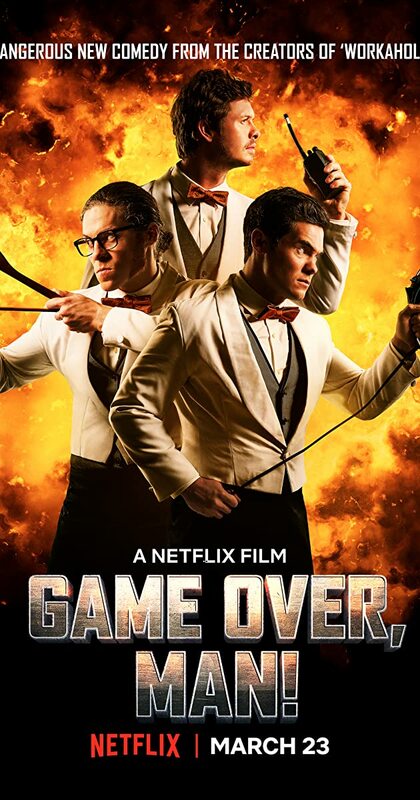 Game Over, Man (2018 – Netflix) was a comedy I was looking forward to since it was written by and starring the dudes from “Workaholics,”, but this is stupid comedy, not smart comedy. Game Over, Man relies on shock value and grossout humor and while it has some funny moments, it’s mostly just really dumb. It’s basically Die Hard with three idiots instead of Bruce Willis and a posse of forgettable bad guys, none of which have the charisma of Alan Rickman. No idea how this movie has a 5-star rating on Netflix, but I expect that start plummeting as more people start watching it. This movie wasn’t trying to be good, but it also didn’t succeed very well at being silly entertainment. You can safely skip this, unless you enjoy bad comedies and a lot of people do. Sequel Potential: There was a sequel teaser similar to the credits of 22 Jump Street. No idea if it’s a real thing or not, but it probably shouldn’t be. Dina Meter: Dina was laughing before she fell asleep, but so was I. I’m confident she would have lost interest too.